It is now time for Mother Earth to return to her perfect awareness. The beings on our planet and Mother Earth herself have lived in duality for a long time, residing in the physical body, experiencing matter and density. After this long separation, the time has come to advance from the third dimension and remember who we are, that we are in fact Light. As we remember, we can help others who are still “asleep” in their awakening so that we all recognize ourselves in Knowing we are all connected in the I AM and the unity of ALL THERE IS. Over the past several years many cosmic events have occurred to help the advancement of Mother Earth and all her creatures to the higher collective energies. The duality of female and male within our bodies is merging with the help of this galactic energy flow, as the Earth merges with the galaxy. This has helped our light bodies merge with our solar light, enabling infinity codes to flow into our bodies, bringing us rejuvenation. 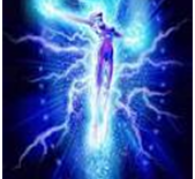 With this attunement your light body can move to the next higher vibration patterns, gradually aligning your vibration and light body. If you are ready you will move into the New Energy, the vibration of 999. This system helps to activate two “new” chakras, The Eranus chakra and the Luinia chakra. You will learn about the monad and your aspects of soul. As you move to the energies of the 5th dimension others in your soul group will have their vibrations raised as well. The fifth dimension is about love, equality and the true potential to live.